When you think of Waterloo you probably think of Napoleon's demise, or perhaps that awful ABBA song from the seventies. 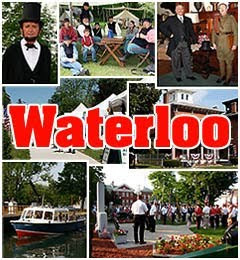 But Waterloo is also a lovely little village in New York's beautiful Finger Lakes region, and the official birthplace of Memorial Day. The holiday started as a way to remember the fallen Union soldiers from the Civil War. There are recorded observances that pre-date the one at Waterloo, but it was here that the event took the form we know today, and has been observed the last Monday in May ever since. President Johnson and both houses of Congress made it official in 1966. The town gears up for this weekend all year long, and they do not disappoint the many thousands of locals and tourists that turn out to join in the celebration. The events range from solemn remembrance of Memorial Day (always on May 30th) at Maple Grove Cemetery, to a parade of classic "Woodie" automobiles down Main St., which were manufactured in Waterloo from 1939 to 1957. There's also an arts and craft show, horse and wagon rides, a kids korner, marching bands, civil war reenactments, canal and lock tours, a 5k walk/run, and even a biker rally. And if you've never been to the Finger Lakes region of New York, you should. There are no timeshare resorts in Waterloo, but upstate new York does offer many wonderful timeshare locations. I am staying a few hours away at the Villa Roma Resort Lodges in Callicoon. This is a four season resort, offering access to great skiing in the Winter, wonderful hiking and sightseeing in the Spring and Summer, and a spectacular foliage display in the Fall. There's an on-site golf course, indoor pool, two heated outdoor pools, kids pool, jacuzzi and sauna, game room, spa, fitness center, ski area and lift, ice rink, and much more. I am staying in a two bedroom villa with a fully equipped kitchen, living room, dining area, jacuzzi style tub, and a balcony overlooking the spectacular Catskill Mountains. Looks like you can find a two bedroom rental on RedWeek.com for $157/night. If you think you might like to own here, resales start at $450. Well it is almost time for the annual Patriot Pizza Eating Contest, so I'd better go get loose. The winner is the first person who can devour an entire pizza, crust and all. I typically don't go for speed eating, and I don't expect to make it to the podium. I'm more of an endurance eater, but it's the least I can do for my country.